Link from Breath of the Wild, wearing the Champion’s Tunic, is now a playable character in Mario Kart 8 Deluxe. 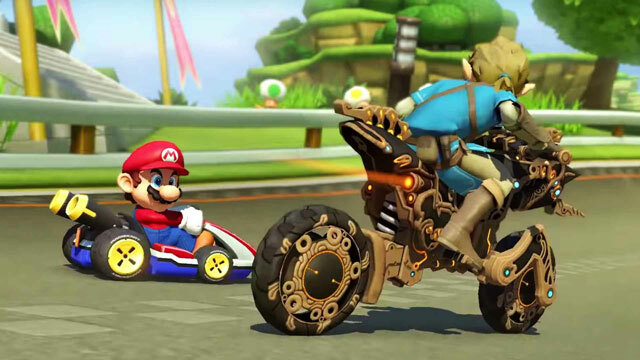 Along with him, the new update 1.6.0 has also added the Master Cycle Zero as a new vehicle, as well as the Ancient Tires set and the Paraglyder, to complete the BotW feel. A new racer has entered the fray in Mario Kart 8 Deluxe. Yes, none other than Link from Legend of Zelda: Breath of the Wild is going to be burning rubber, along with Mario and other Nintendo characters. He’s sporting the Champion’s Tunic, as is only appropriate. Along with Breath of the Wild Link comes his trusty motorcycle, the Master Cycle Zero, introduced to BotW in the Champion’s Ballad DLC. Also, there’s a new tire set, called Ancient Tires, again fitting the theme of Breath of the Wild. Incidentally, if you still haven’t unlocked the Master Cycle in BotW, you can check out our Zelda BoTW Master Cycle Zero – How to Get Motorcycle guide. The patch notes for Mario Kart 8 Deluxe update 1.6.0 are fairly sparse, as is customary for Nintendo. However, they do also mention that, along with Link, Master Cycle Zero, and Ancient Tires, you’re also getting a new glider, called simply Paraglyder. This is, of course, the paraglyder you use in Breath of the Wild to get around, which you can now attach to your vehicle in Mario Kart. Lastly, the patch notes mention “revisions to improve gameplay”, and also “some content not listed here.” What that means is anybody’s guess, but my estimation is that it’s just further bug fixes and the like. The update 1.6.0 that introduced all of the new Breath of the Wild content to Mario Kart 8 Deluxe came out on July 19th, and it’s free, so you can dive right into it. Ladies and gentlemen, start your engines!